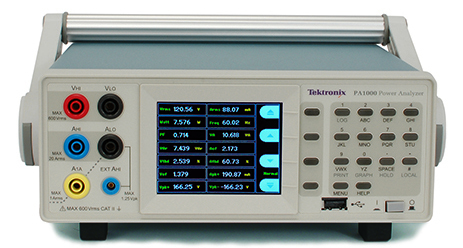 In March 2013, Voltech transferred all its power analyzer technology to Tektronix. You may have arrived at this web page by searching for a Voltech power analyzer such as the PM1000+, PM3000 or PM6000. The PA4000 is a versatile precision 4-channel power analyzer, and the best-in-class PA1000 single-phase power analyzer is optimized for measurements of power, efficiency, standby power and harmonics on power supplies and all electrical equipment during their design and production test. We invite you to learn about the new power measurement solutions from Tektronix by browsing this site. For service and support on your Voltech PM power analyzer, please click here to return to the Voltech web site.